Here is my project for the wet/dry embossing challenge over at Creative Moments. My mojo has been in a slump lately, but I'm happy with the way this turned out. 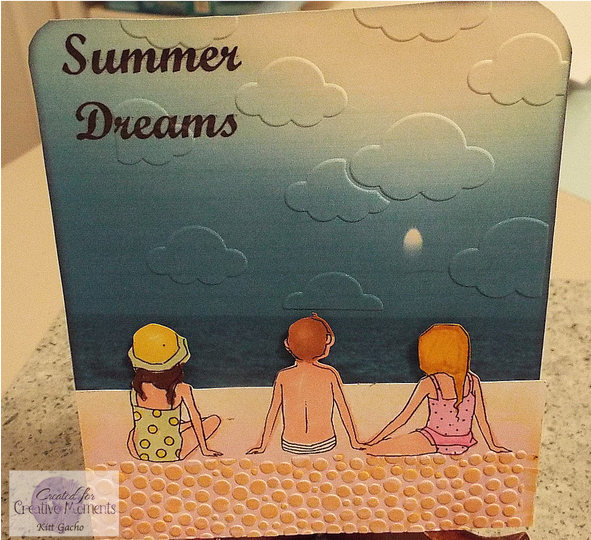 I used Darice clouds embossing folder and the Cricut bubbles folder for the sand. The water background is from Scrapbook Max program. I used both Spectrum Noir and Chameleon markers. The kids image is from our sponsor A Day for Daisies. I used the Silhouette Cameo to cut and print them. The beach scene is layered over the water/embossed cloud background. The kids heads are on pop dots. It really looks good in person with the embossing. Thanks for stopping by today and leaving your comments. I love hearing from you. Have a happy crafty day.